The September garden is always chocked full of butterfly activity. The morning started off with the rather drab Dusky Wings making its way around to the blue porterweed in the veggie garden. Drab brown or not they still fascinate me. Flitting about with its quick movements the skipper landed on the confederate jasmine leaves momentarily. ...Nectaring at the Firebush, Hamelia patens. 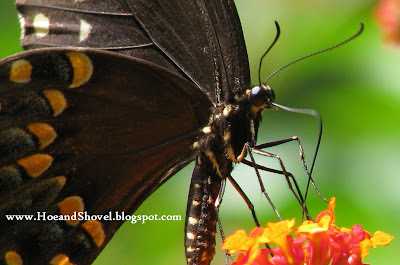 One of my very favorite butterflies.... wingspans range from 1.4 to 2.5 cm. Host plant in my garden is the plumbago. They are just so dainty, yet flitty, and erratic in flight. Their beautiful blue wings when open are brilliant. 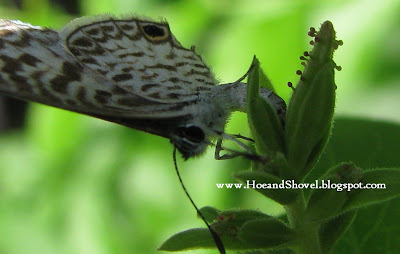 A perspective of its size with its entire face buried in the small opening of one of the trumpet shaped lantana petals. 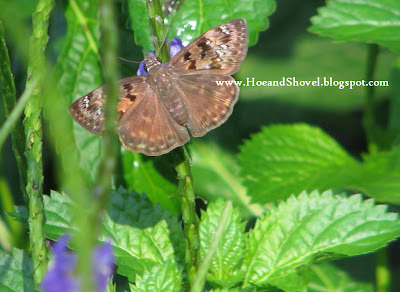 Plumbago, host plant, offers refuge for egg laying. We have enjoyed a large population of Zebra Longwings, Heliconius charitonius tuckeri this summer. I've convinced myself it is due to the passion-flower vine, passifloraceae which is its ONLY host plant. I planted it in the spring hoping to attract more of the Longwings to hang around. 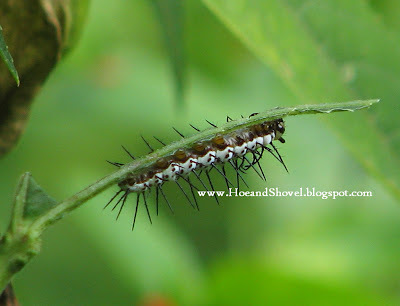 Last-stage caterpillar. 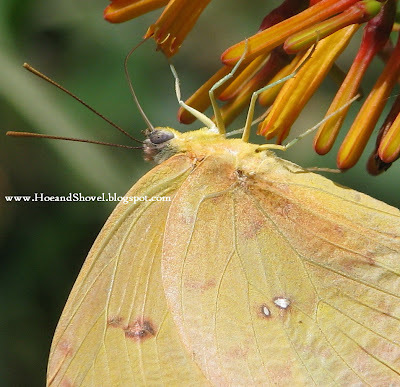 It seems the Gulf Fritillaries made the vine their home in the spring and now the Longwings are taking their turn. A closer look and even I was surprised to see so much activity going on high up in the air on the tips of the vine. Many generations are produced each year. 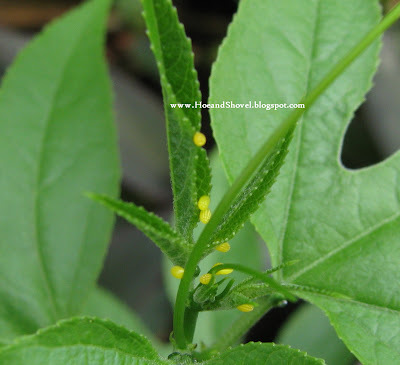 Elongated yellow eggs are laid in small groups on the young leaves of the food plant. Today, I witnessed this process in action. And now there are more eggs just seconds later. 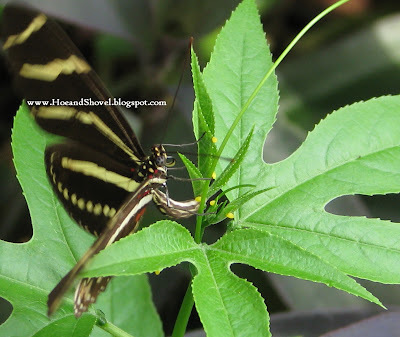 Adults of the Zebra Longwing occur all months of the year in south and central Florida. Zebra Longwing is unusual in several aspects of adult behavior. One such behavior is pollen feeding. Females visit flowers not only to sip nectar, but to gather a ball of pollen at the tip of the proboscis. Regurgitated enzymes digest some of the pollen into smaller components, especially proteins, that can be used for producing eggs. The Firebush, Hamelia patens, a native plant is sited right next to the host plant. Regardless, that firebush gets visitors of all sorts. There was another hummingbird on it today as well. I hesitate to even say it. It was way too fast for me or my clicker. Out of nowhere it came and it went away the same route. 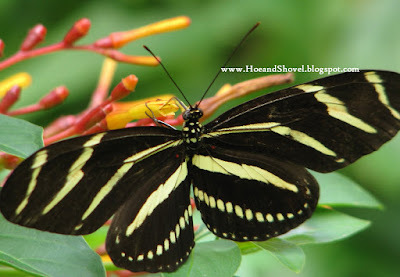 The Zebra Longwing became the official state butterfly of Florida by an April 1996 vote of the legislature. 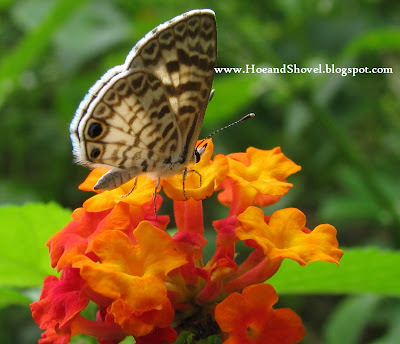 Its flight is slow and fluttering and graceful unlike any other butterfly... at least in my garden. It is one of my favorites for that aspect alone. It was a good day to be in the garden. I'm so happy to see so many butterflies down your way, Meems! They are scarce this year for some reason. By this time of year my flowers are covered with Painted Ladies, but they are non-existent this year. I've been missing them and your wonderful post is the next best thing! You got some amazing shots of the zebra laying its eggs. That is incredible! I've never found and butterfly eggs though I've looked. Oh, I love all the different butterflies you are seeing! Just beautiful! Meems, this post is sooo interesting! Amazing shots and so much information! I've learned a lot and I've enjoyed it thoroughly. What great photos of the life stages of a Longwing. Wow. I love that Cassius Blue too. 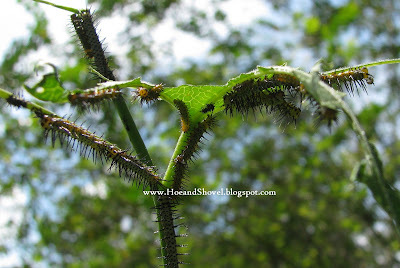 It looks like you are going to have lots of butterflies with all those caterpillars scarfing up the passionflower. Fascinating post Meems. 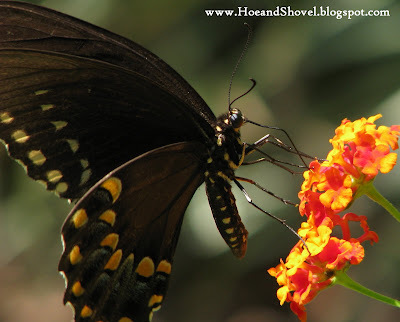 Wow, there's so much of butterfly activity in your garden. Loved going through the whole series of the most beautiful shots! Wonderful post!! 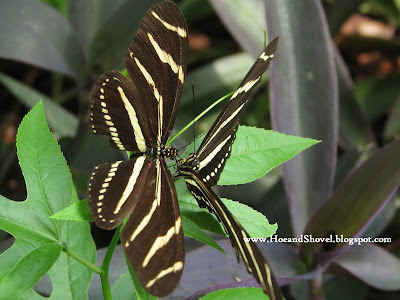 I love all of the information and photos of the Zebra Longwing...I must get a passion vine now....We have so many different butterflies this year. So my project of attracting butterflies from last year is working pretty good! I'll take all of the tips you have for inviting flying friends!! Nice captures. I've been chasing flutterbys all week trying to get some pics. I've got my own 'French' name for all of them now. 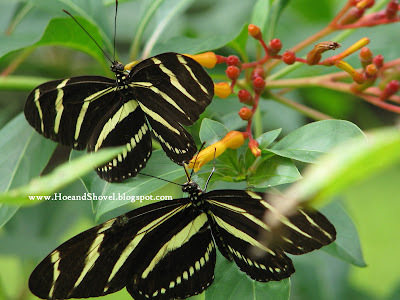 Zebra Longwing pics caught my attention when I was attempting to ID the couple of butterflies I did manage to photo. They really are nice and it's no wonder they became your state's official butterfly. Ah, your photos of the butterflies are absolutely beautiful! Oh, the Longwings! It's been probably ten years since I've seen one here. We still have native passiflora all around, but no Longwings, just Gulf Frits. 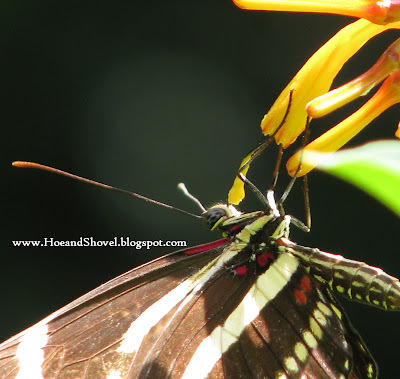 The only Longwing I see now is the framed photo of one that someone gave me, that hangs beside my bed. This is a great post, thanks for taking such patiently captured pics and sharing. Hi Meems~~ A good day to be in the garden? I'll say! And thank you for sharing it with your blogger friends. Your butterfly population is fascinating. 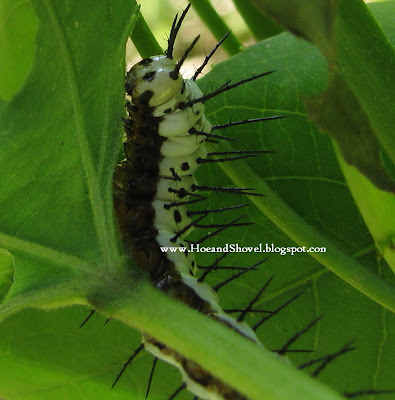 I can see that you don't mind sacrificing a bit of unseemly leaf chewing for the sake of the hungry critters. I suppose this would be the ultimate test of the wildlife gardener--striking a balance between beauty and practicality. You seem to have pulled it off wonderfully and now you're being rewarded big time. Wow---you do have the butterflies, Meme.. SO many varieities...I love the Zebra Longwing.. Don't think I've ever seen that one before (or haven't noticed it)... Gorgeous! all your butterflies are happy and content, meems to be in such a lush place to grow up and fly. how exciting to have your own little butterfly conservation area...we need gardens like yours that anticipate the whole life cycle and plant accordingly. i am so delighted for you that you have had such great success. these captures are great to be able to look at....seeing as we have had somewhat of a shortage. i love watching the mother lay her eggs. that is a first for me. I had a Zebra here in the yard in 1997 it was one of the first documented sighting in NC. Your photos are wonderful the Zebra especially. 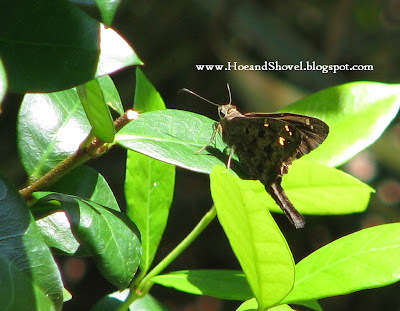 The duskywing could not be the spring flying Juvenals it has to be the nearly identical Horace's Duskywing. Stunning photos, Meems! And yes, you do seem to be in Butterflyland at the moment. I loved seeing your butterflies. The Cassius Blue really is dainty. 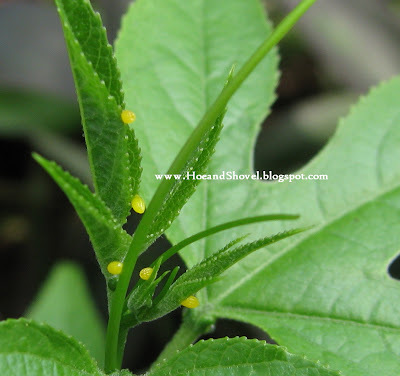 Are those its eggs on the Plumbago buds? How unusual! The Zebra Longwing looks a little bit like our Common Sailor. I think its the colouring . 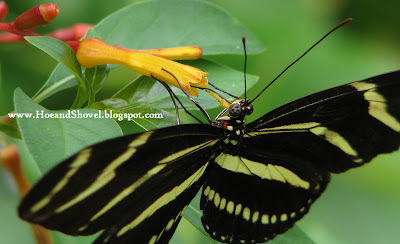 If The Zebra Longwing has slow flight, he must be poisonous to predators. Thats evolution for you! I love your photos. It thrills me to have visitors in my gardens.